Having my own business has always been my dream. You know, to be able to do what you like to support yourself. To be able to create something that no one else can and have it be useful and beautiful at the same time. 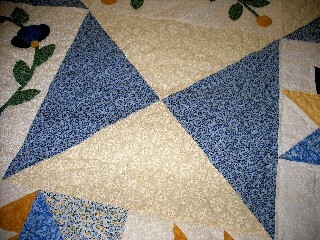 My name is Jan of course and I became interested in quilting about 45 yrs ago. But until about 10 years ago I just did it for relaxation and hobby. I like it so much I wanted to do it all the time. 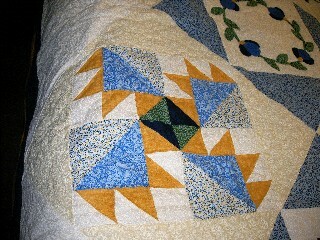 So I started Quilts by Jan and am working on increasing my customers and sales. I hope you enjoy my web site and feel free to email me if you have questions. We love to quilt and our quilts show it. 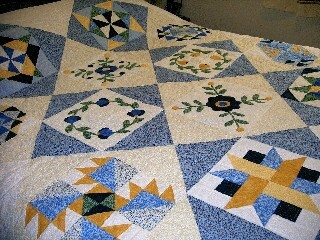 This is an example of a sample quilt. 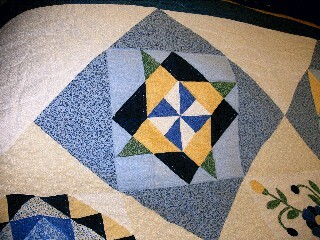 The sample quilt consist of a usual 12 blocks, representing the months of the year. Each pattern is different but usually in the same color combination. 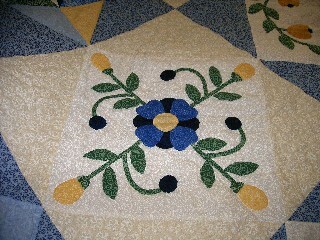 It consist of geometric patterns, and applique patterns. This one was done from a kit where the patterns, colors, and designs where picked out for you and then packaged for you to cut, sew together and finish. I did this one completely by hand. There are many ways to complete these types of quilts.